Keep these sentences sharply in mind as you read the rest of my report on last night’s meeting, the final one before the Boston School Committee votes the proposed Budget on Tuesday. There is more in that same handout, titled “FY16 Budget Recommendation Update.” In it we are informed, for example, that Boston’s public school transportation system is “the most costly in the nation,” that “we spend $ 100 million, or 10% of our entire budget on transportation.” We also find out that the cost of merely maintaining the same school services as exist in this budget year would go up by $ 58,000,000 in FY 2016, were no changes made. That $ 58 million more than wipes out the entire $ 38.5 million increase granted by Mayor Walsh to Boston’s public school system — a grant far larger than walsh has given to any other City department. Keep these things in mind, too, as you read my report. The Budget hearing at English high school was well attended. At meeting’s beginning the auditorium was full — probably 300 people. Maybe 50 of these testified in the “public comment” portion of the School Committee hearing. Before they spoke, Superintedent McDonough delivered his personal memorandum, copies of which were also handed out. In it he addressed, again, all the Budget shortfall responses that he proposed when the FY 2016 Budget process began : staff reductions, school closures, expanding the use of MBTA transportation, changes in funds allocated to individual schools, and reforms to the school lunch program. No one testified in opposition to central office staff reductions — which are severe : 134 positions are being eliminated, every administrative segment being affected. $ 16,600,000 will be saved via these layoffs. It isn’t enough to close the $ 34 million “structural imablance” (in other words, deficit), and so the Budget also proposes a $ 9.5 million reduction in transportation costs, a $ 4 million slash to school lunch services, and school closures providing a $ 2.5 million saving. To these reductions there was plenty of opposition, much of it passionate, a lot of it spoken by current students, many of whom read prepared statements. There was similar opposition to reallocations of school funds by students (and some staff) of schools losing funding, especially Madison Park High School, which Mayor Walsh in his 2013 campiagn assured would become the locus of a state of the art vocational high school. Evidently that vision has been deferred to needs deemed more pressing. Which is where that sentence I quoted up top, about the upward pressure of salaries and benefits, comes in. It was difficult not to conclude that the testimony given at last night’s hearing was — most of it — directed by the Boston Teachers’ Union (BTU), whose operatives were seen in the foyer outside the hearing room. Blame for the cuts and closures was laid to charter schools and “outside operators” — the BTU wants both of them gone. No testimony at all was said about the upward pressure of salaries, and the only witness reference made to the “co-teacher” situation (in which teachers not hired by any Boston public school are kept on payroll and sent to other teachers’ classrooms to assist, I guess) attacked the Boston Herald story in which the practice was revealed to readers. Nor did any of the witnesses asking to keep open the three schools to be closed say one word about how to pay or it. 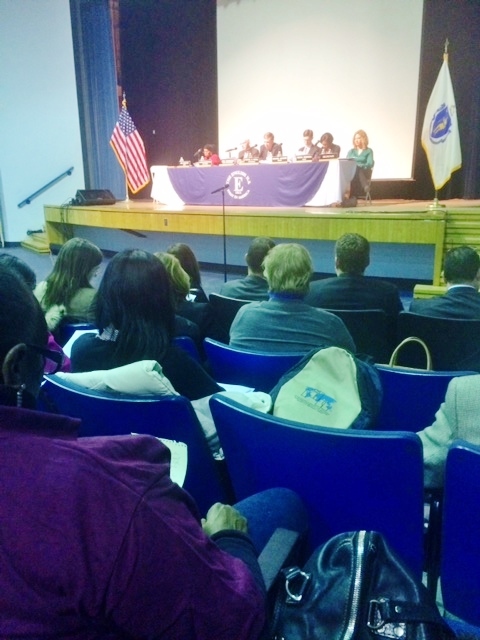 Councillor Tito Jackson decried the closure of the Elihu Greenwood Leadership Academy, whose “5th year of turnaround status,” as McDonough’s memorandum put it, Jackson attributed to the school being operated by “outsiders.” Jackson called for more use of school system “insiders,” without one word as to the upward salary and benefits pressures that insiders are imposing on the Boston school budget. Meanwhile, school consolidation goes forward, as the Superintendent pursues effectiveness first, second, third, by any and all means available within the small manoeuever space he has managed to stake out. Testimony by Madison Park High school people certainly made sense. Why isn’t Madison Park High School being transformed to the cuttng edge vocational high school Walsh wanted in 2013 and, presumably, still wants ? Evidently the $ 5 million budgeted to fund teachers’ compensation for the Extended Learning Time agreement — by which the school day will be lengthened 40 minutes, in 60 schools, 20 of them this first year — comes before. $ 1,013.5 billion, can only implement one small reform at a time. At some point, something has got to give. Because one small reform at a time is barely worth the effort — a full year of effort, of staff, preparation, and hearings — that goes into making it happen. But if worthwhile reform is to proceed, staff salary hikes will have to take a time out. Teachers, aides, principals will all have to repurpose, forge new work rules, and re-budget. If not, then the number of charter schools will be increased — by overwhelming public support — and public school systems like Boston’s will be superseded by a new model of public education.